to make the best tents possible. It's that mission that means Tentipi don't use an off-the-shelf fabric for our tents. Instead, they've developed a special fabric with much better water repellent properties. So we'll keep you dry. It's that mission that drives Tentipi to test their tents to destruction, and create detailed structural calculations for all configurations of single and linked tents. So we'll keep you safe. It's that mission that creates an obsessive attention to detail, resulting in the beautiful detailing in the spectacular structure we'll build for you. We're aiming to delight you. Our Nordic Tipis are designed and developed in Lapland. They have been tried and tested in the rigours of the harsh environment there. Tentipi has always paid proper respect to the Sami kåta, the structure on which they are based. Authentic to the core. Isn’t that refreshing in this day and age? "Your foundations matter, because they influence your behaviour. I’m Swedish, born and raised deep in Lapland. Integrity, authenticity and respect are my foundations, and it is on those foundations that we’ve built Tentipi." That year, just like every other year, the determined rays of the spring sun had transformed frozen shapes into playful, dancing water. Life, barely evident during the cold winter months, had now re-appeared in nature with an explosive force. This was a great time for canoeing. High water levels and good speed in the rapids, getting close to nature, socialising and relaxing together in the Swedish wilderness. Well that was the plan. But when setting up camp after a day of paddling the air was filled with mosquitoes. Six people, two small tents and a million mosquitoes rather destroyed the socialising and relaxing together. So there I was, sitting on a stone beside the river brushing away the mosquitoes, thinking about how the optimal tent for relaxing together could be designed. It's not so easy to socialise and relax when insects are greedily trying to feed off you and when the tents are too small for everyone to fit into one tent. Now, let's see, wouldn't it be good if… and then you could… and then perhaps…? Many years then passed before I returned to that line of thought. 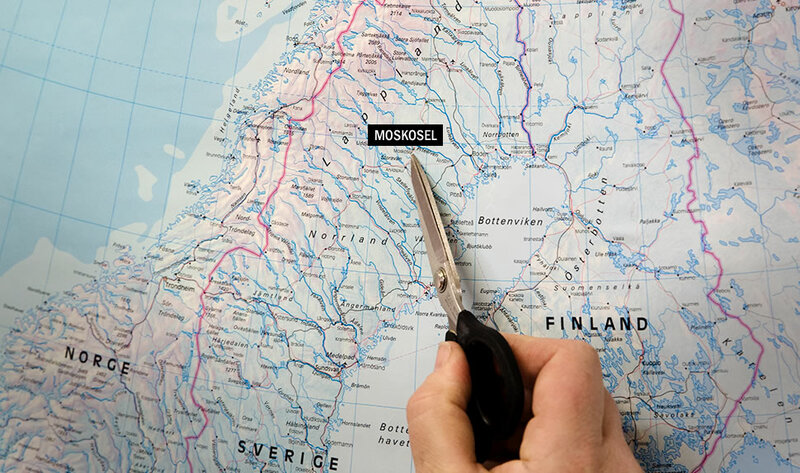 It was in the village of Moskosel in Lapland's inland where the ideas which had formed while sitting on that stone were to be revived and developed, more than ten years later. I had just moved into the village and was working as a church warden. One evening, as I was changing a bulb in the church hall, it was not only the lamp that lit up. Standing on a chair, I suddenly had the idea of my life, namely to start making Nordic Tipis. My experience of such work consisted of sewing a doll's skirt on my mother's sewing machine at the age of five and then making a canoe cover at the age of twenty. But armed with a large dose of self-confidence, I took on the challenge of turning enormous pieces of cloth into Nordic Tipis. Throughout my entrepreneurial journey with Tentipi, I have relied on my self-confidence as my greatest asset - almost any problem can be solved. At first, I did everything myself, from purchasing and sewing to marketing and selling. However, it did not take long before employing the first worker. The tent production proved to be profitable and new products began to be developed. The idea of designing the best tent in the world began to grow and after more than 1000 hours of thinking and many failed attempts at constructing it, the prototype of today's single pole Nordic Tipis (what we now call our Adventure range) was ready. The larger tents (our Event range) also took on new shapes and functions. Then I invented the Stratus Nordic Tipi (or Giant Hat as I originally called it), with sides that can be raised up, and in no time at all, it became a favourite among rental businesses and event companies. The Sami kåta is a simple cone-shaped frame of wooden poles covered with animal hides, with an opening at the top to let out smoke. Very quickly the indigenous Sami people of northern Scandinavia could build a wind-resistant home that was easy to keep warm, as they followed the migration of their reindeer herds. Support for Swedish Society for Nature Conservation's campaign to stop bottom trawling.